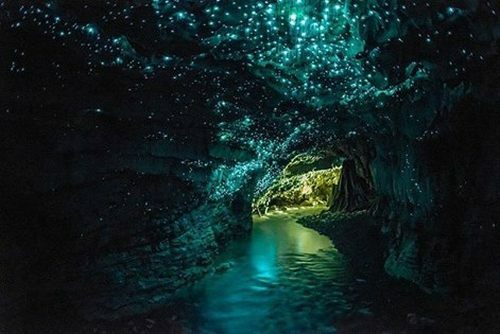 A number of booking sites are showing flights from Vancouver to Auckland with Air New Zealand for as low as $522 CAD roundtrip including taxes. 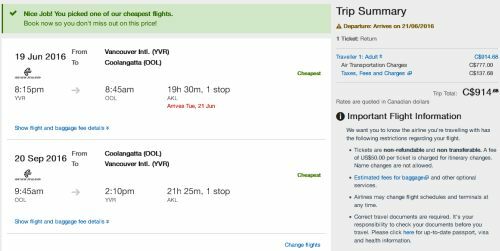 If you're up for taking a really long trip to New Zealand, there also seems to be flights from June to, say, November 2016 available for $523 CAD roundtrip including taxes. It doesn't have to be November that you return though. When testing it out, you can try changing the return date on Kayak to a date in August, September, October, November, or December 2016, or January, February, March, or April 2017, and you still have a good chance of finding flights for $514 to $532 CAD roundtrip including taxes. You can also find flights from Vancouver to Sydney (SYD) or Melbourne (MEL), Australia in the $900s CAD roundtrip using this same method. It's nowhere near as crazy as the prices to New Zealand, but still cheaper than usual. Vancouver to The Gold Coast (OOL), Australia is also available in the low $900s CAD roundtrip. Other cities in New Zealand: Vancouver to Christchurch (CHC), Wellington (WLG) , or Queenstown (ZQN) are available for $601 CAD roundtrip including taxes. One Response to "Vancouver to Auckland, New Zealand - $522 CAD roundtrip including taxes"
Have they fixed this online? im trying ot book and not getting these fairs.